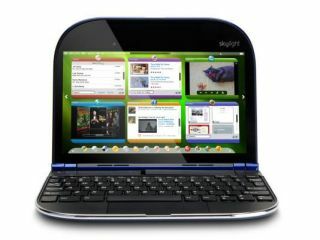 Lenovo's Skylight - take the first half of smartphone, the second half of netbook - what have you got? Lenovo has announced the Skylight sub-notebook which uses Qualcomm's Snapdragon chip, runs Linux rather than Windows and will sell for around $499 (£308) when it goes on sale in April. Lenovo in the US is using the increasingly common term 'smartbook' to describe the device – which is smaller than a netbook but bigger than a smartphone – although in Europe there remains a copyright dispute over the use of that name. Weighing in at around a kilogram, the Skylight will apparently boast 10 hours of battery life, has a 10 inch screen and has Wi-Fi and 3G connectivity. Most netbooks use Windows XP and feature Intel's Atom processors, with early attempts at pushing Linux to consumers – in the original Asus Eee for instance – not really getting any purchase. However, Lenovo's consumer marketing director told Reuters that the operating system should not alienate mainstream consumers, with the Linux heavily customised. "There is no exposure of Linux to the customers. What we wanted to make is an interface that's completely custom and easy to use." Qualcomm's Snapdragon processor is becoming a key player in smartphones, with Google's Nexus One handset the latest to use it.